This course is part of the Yammer curriculum for Social Media University, Global. It shows you how you can adjust your personal settings to tailor Yammer to meet your communication needs. After you’ve experimented with Yammer, please share your impressions in the comments. And if you find this course helpful, you can use one of the buttons below to share it with your friends or the broader community. I welcome comments and further discussion from those in the group this morning as well as any others who might want to join the discussion. Screencasting is a way of letting other people see what is on your computer screen. It lets you capture either the whole screen or a particular portion and create a movie file that you can upload to a video sharing service like YouTube or Facebook. The benefits of a screencast are obvious, particularly for SMUG. Instead of a slideshow of a sequence of static screen shots uploaded to Slideshare.net and synched to a sound file (pretty good alliteration, huh? ), we can now show and tell with full motion, so you can see exactly how to do things. Pictures are extremely helpful, but movies should make the teaching clearer and the learning easier. But how do you (or I) turn my computer screen into a movie? For Mac OSX, Ambrosia’s Snapz Pro X is an excellent screencast software choice. It’s easy to use, and I was most pleased that it not only delivers great movies of my Mac screen, but also my Windows XP partition. 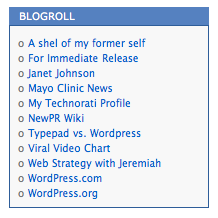 You can see that example in this post on social sharing with WordPress.com. Unlike most of what you see in SMUG, Snapz Pro X isn’t free: it costs $69. But I think it’s worth it for the power it gives you. Shoot the video of me talking using a Flip on a tripod. Play the video at half-size, while capturing the surrounding 640 x 480 window using Spapz Pro X screencast software, and then saving to a QuickTime movie file. Open that file and repeat the cycle, creating another QuickTime file that could again be played at half size. After repeating a couple of more times to create the “hall of mirrors” effect, edit the pieces together using iMovie or Final Cut. The point, besides having some fun showing a movie of a movie of a movie, was to show that through screencasting you can do show-and-tell training demonstrating anything on your computer screen. Ironically, the only thing I can’t screencast using Snapz Pro X is a step-by-step introduction to using Snapz Pro X! I still like Slideshare and will use it to some extent (particularly for the Snapz Pro X course), but I think a screencast can be a much more effective way to teach. If you’re a Windows user, this list from Mashable has some screencast software alternatives. What do you think? How could you use screencasting for your training programs? For those who attended the Ragan Communications Workshop led by Shel Holtz yesterday, here are the slides I presented for our case study, sharing examples of what Mayo Clinic is doing in social media. I hope many of you will enroll in SMUG today. It was great offering an extension class, and I appreciated all the comments and questions. Stay in touch!